Muévete! is back for another session at Notting Hill Arts Club. 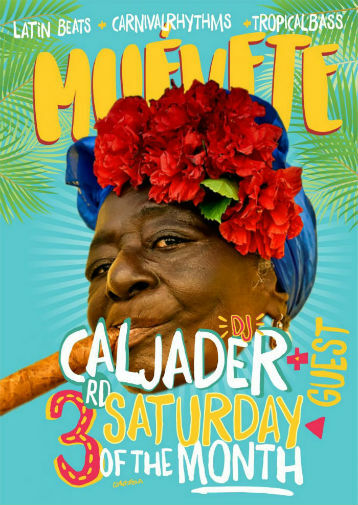 DJ Cal Jader is joined by special guests to bring you a night of heavy Latin and tropical vibes. Muévete is Movimientos’ west london residency – a monthly fiesta with a dance floor-slammin’ mash up of raw Latin beats and tropical bass. Everything from the rolling Latin rhythms of salsa, cumbia, merengue and samba to the reggaeton, hip hop, dancehall, moombahton, afro-latin house and big brazilian and caribbean carnival rhythms with Afro-beats, soca and global underground sounds. Putting it simply Muévete translates as ‘Move it!’ so we’re not messing around – straight to the dancefloor! Thank you Notting Hill Arts Club.